Cameron Park Zoo Aquarist Brittanie Delorit performs as a mermaid during one of the shows. The mermaids will return June 16. Cameron Park Zoo Aquarist Brittanie Delorit (left) and Zoo Education Coordinator Jacquelyn Wilson perform as mermaids during a show at the zoo. Cameron Park Zoo Aquarist Brittanie Delorit performs as a mermaid during one of the shows. 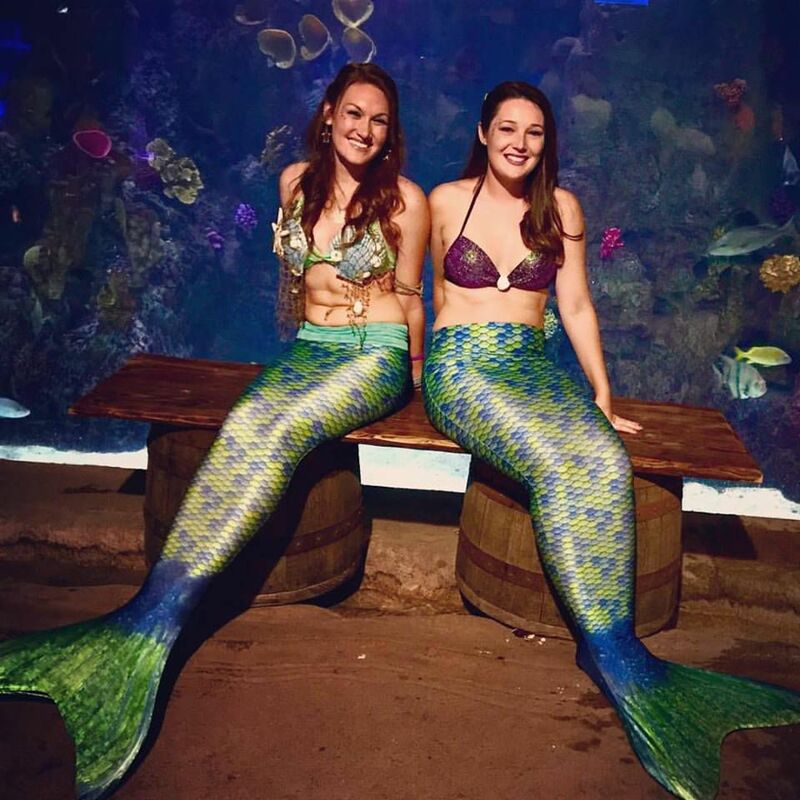 Cameron Park Zoo employees dress as mermaids. One of the Cameron Park Zoo mermaids swims through a tank. A few employees pose as mermaids at the Cameron Park Zoo. Mermaids go for a swim at the Cameron Park Zoo. Cameron Park Zoo Aquarist Brittanie Delorit waves to zoo visitors during a recent show. Cameron Park Zoo Aquarist Brittanie Delorit performs as a mermaid. A mermaid swims with fish on display in one of Cameron Park Zoo's aquariums. A colorful tail appears in the water. That’s when the screams of excitement begin. From inside the saltwater aquarium, the squeals and cheers come across as a muffled roar for the mermaids as they dive to the bottom of the 3,500-gallon tank, eluding inquisitive puffer fish and daunting moray eels. That’s been the experience of performing mermaids during occasional visits to the Cameron Park Zoo over the past two years. By popular demand, the mermaids will return to the zoo June 16 for a brief swim with the fishes and pictures with fans. The zoo at 1701 N. Fourth St. hosts the mermaids at 2 p.m. in its saltwater aquarium at the Brazos River Country exhibit. “The Little Mermaid” continues to be Delorit’s favorite Disney movie, a fitting tribute for the redhead who always dreamed of being Ariel. But the main character from Walt Disney Pictures’ 28th animated film certainly travels the ocean waters more gracefully, said Delorit and two fellow mermaid actors: education coordinator Jacquelyn Wilson and Priscilla Duran, aquatics animal care supervisor. The grace certainly ends, the women joked, once they leave the water out of visitors’ view, where they emerge with bloodshot eyes and mucus draining down their face. But their hair is on point in the water. The mermaids wear monofins and a swimsuit top underwater. They keep their eyes open in the saltwater and surface periodically for air. During some presentations, men will carry them — because mermaids can’t walk on land — to a rock to sit while youth give hugs and get pictures. For their out-of-water appearances, the women have crafted tops more akin to a Disney princess. The more decorative pieces are only worn outside of water to prevent any stray pieces from falling off in the tank and becoming an unhealthy fish snack. 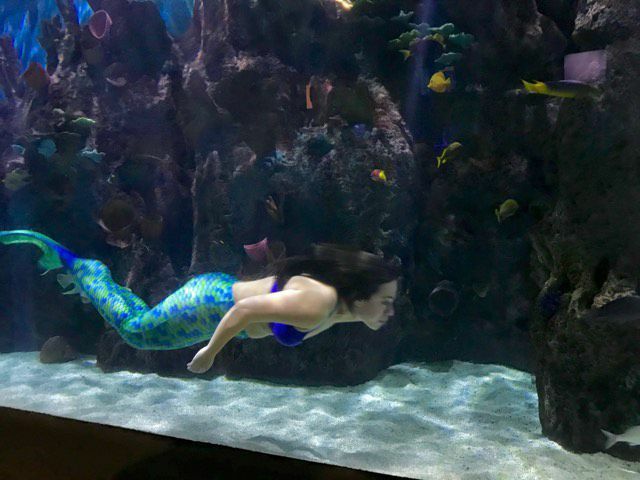 The mermaid display has continued for two years at the Cameron Park Zoo, with the exhibits frequency largely dependent on requests and the need to practice the swim. The shows have grown more popular and the upcoming show is expected to be packed. Swimming with one’s legs together is not natural for these land dwellers. The first instinct upon wearing the fins is to bend at the knees to propel forward. The monofin help propel the women across the tank, Duran said. The mermaids also have to adjust to the cold 74-degree water, she said. When the program started, the fish inside the tank were a little taken aback by their new guests. Most — including Nike, the French angelfish — are now hardly fazed by the entry of the long-haired mythical creatures. But two green moray eels also traverse the waters. “We’ve had times where they’ve chased us,” Duran said, adding the sharp-toothed eels are more curious than aggressive. The women said the children tend to favor the mermaids, while “older ladies” tend to enjoy the mermen. Local mermen won’t make an appearance at this show, but have in the past and will for future performances. Zookeeper Isaac Burkhalter and herpetology keeper Zachary Byrne said that unlike the women, they never dreamed of becoming mermen. Burkhalter said the first time in the outfit was awkward. “It’s a weird experience not being able to use your legs, but it’s more just trying not to drown,” he said. He said he was thankful they originally practiced without a crowd. “It was dark in here and there was no one to laugh at us,” he said. However, when there is a crowd, there’s a way to be a little less self-conscious. “You can kind of look at an angle and everyone’s warped so you don’t have to look at anybody,” he said. 2 p.m. June 16 in the saltwater aquarium at the Cameron Park Zoo, 1701 N. Fourth St.
For more information, go to cameronparkzoo.com.